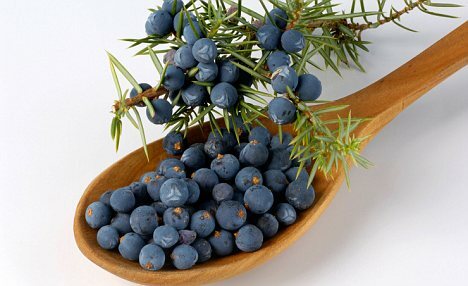 Juniper berries make an excellent antiseptic for urinary tract conditions such as cystitis. Their essential oil is quite stimulating to the kidney nephrons, however, so people with kidney disease should avoid this herb. Juniper’s bitter action aids digestion and eases flatulent colic. The herb is taken internally for rheumatism and arthritis, and, used externally, helps relieve pain in the joints or muscles. In the laboratory, a juniper extract demonstrated potent inhibition of herpes simplex virus type I in human cell culture. Berries were known to Greek, Roman and early Arab physicians as a medicinal fruit and are mentioned in the Bible. Several medicinal recipes survive in Egyptian papyri dating to 1550 BC. During the Renaissance, they were recommended against snake bite and plague and pestilence. The oil extracted from juniper has an ancient reputation as an abortifacient (which may have echoes in the Victorian belief in the effectiveness of gin for the same purpose). In Lothian, in the medieval period, giving birth ‘under the savin tree’ was a euphemism for a miscarriage or juniper-provoked abortion. Until at least the mid-1980s juniper pills were being advertised as “The Lady’s Friend” in the small ads in ladies’ journals. Tolerates most soils in sun or partial shade. Tolerates acid and alkaline conditions, dry and wet soils, and exposed positions. The fruits are green throughout the first two years. They then ripen every two years at different times. Fruits are collected by shaking branches over a groundsheet; they are used fresh for oil distillation or dry the berries below 95F to retain the essential oil for infusions, liquid extracts, tablets and tinctures. If you want berries, be sure to plant both male and female junipers, or the females will not fruit. The berries are edible; they are ripe when blue. They are sometimes roasted and used as a coffee substitute; they also can be dried and ground and used as a spice, much like pepper. Along with the branches, the berries are also used to flavour gin, chartreuse, and other alcoholic beverages. Appetite loss, arthritis, catarrh, cholera, cystitis, diabetes, dysentery, flatulence, flu, gonorrhea, gout, kidney stones, tapeworm typhoid, and urinary tract infection. Juniper berry stimulates the flow of urine by increasing the glomerular filtration rate, the process by which blood and wastes are purified. A small amount of the berries (five to seven) eaten before a meal helps stimulate hydrochloric acid production; eaten every day, they help clean out residues of tar and nicotine in the lungs for smokers who are quitting that habit. The berries are mainly used for urinary infections and prescribed to clear acid wastes from the system in arthritis and gout. They reduce colic and flatulence, stimulate the digestion and encourage uterine contractions in labour. It is a valuable remedy for cystitis, and helps to relieve fluid retention but should be avoided in cases of kidney disease. 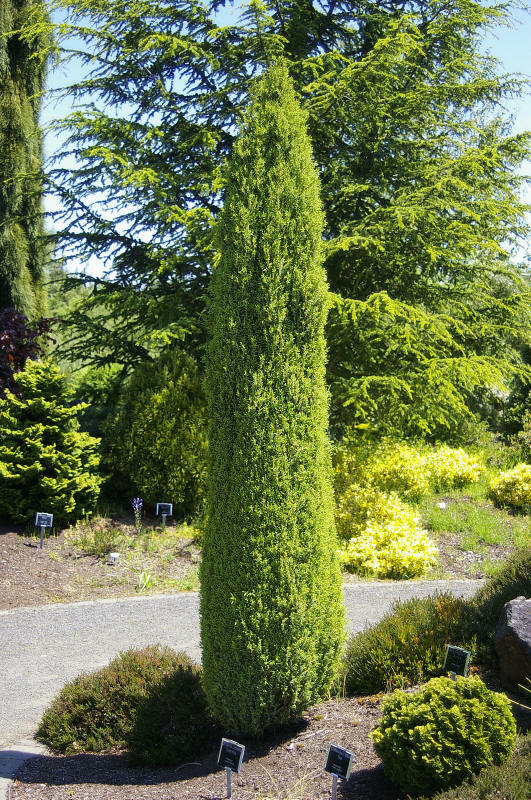 In the digestive system, juniper is warming and settling, easing colic and supporting the function of the stomach. Taken internally or applied externally, juniper is helpful for chronic arthritis, gout, and rheumatic conditions. Juniper contains a potent antiviral compound (deoxypodophyllotoxin). The extracts appear to inhibit some different viruses including those that cause flu and herpes. Large doses of juniper cause the urine to smell of violets. Being disinfectant and insectifungal, the berries are used in veterinary medicine to treat open wounds. Its disinfectant action is similar to that of pine cleaners. As a diuretic, the oil is thought to increase the production of urine by irritating the kidney’s filtration glomerulae. The oil is also irritating to microbes, so much so that it kills many of them. Traditional formulas are in combination with ginger and dong quai or with goldenseal or with uva ursi. People with kidney disease should not take juniper berries. They should also be avoided in pregnancy. Overdose may lead to kidney and skin damage. Overdose symptoms include albuminuria (excessive protein), hematu­ria (blood in the urine), purplish urine, tachycardia (increased heart rate), hypertension (high blood pressure), convulsions, and metrorrhagia (non-menstrual bleeding from the uterus). Other possible adverse effects include hypotension (Low blood pressure), irritation, blisters, burns, liver toxicity, kidney damage, or kidney failure.